Scheggia villa is located near the San Ruffino lake and at the edge of the National Park of the Sibillini Mountains. Along the banks are deer to find and there are a few observation points plotted. In spring and summer you can take a canoe trip on the lake. Also, you can make beautiful walks by the lake in the hilly area. 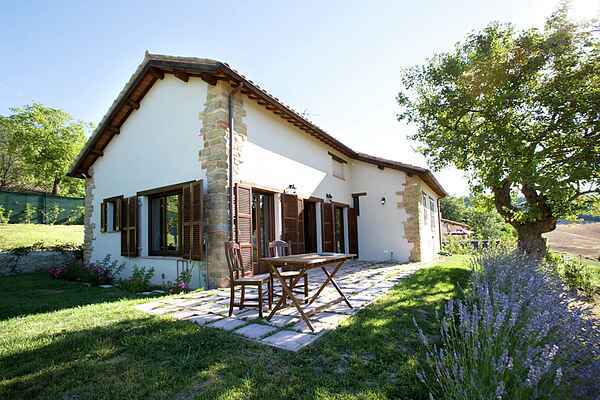 The location is spectacular and there is a panoramic view of the Tenna Valley and the Sibillini mountains. It is an ideal holiday home for a relaxing and peaceful holiday yet it is not far from the many attractions there are shops and restaurants in the nearby town and the Adriatic coast can be reached in 45 minutes. why not enjoy a Shopping Tour Luxury Brands at the Outlet Village IL CASTAGNO. Free visit of Prada showroom and other luxury shops ( Pollini, Roberto Botticelli, Pantofola d’oro, etc.). Visit of TOD's outle At agriturismo Le Spiaczzette (www.lespiazzette.it) you can buy delicious homemade jams. Do you fancy a coffee, then you stop just at Grancaffè Belli Amandola. They also have delicious pasticcini and cornetti. The aperitif drinks are good. Sibillini: A spectacular mountain range with beautiful landscapes. In summer (late June / early July) is in bloom and it is wonderful to see. Walk and enjoy!